Medals are a time-honored award for achievement in sports and academics and the 2" Superstar medal is a beautiful medal at a budget-friendly price. The Lamp of Knowledge medal features a Lamp over a background of stars on the front and a 1 1/2" personalization area on the back. The ring at the top makes it simple to attach to a ribbon, chain, or even a keychain to complete your award. 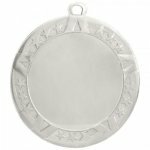 Available in 26 styles and an insert holder for a custom design you're sure to find just what you need for your awards. Superstar Medals are available in Bright Gold, Bright Silver, and Bright Bronze. Medals are a time-honored award for achievement in sports and academics and the 2" Superstar medal is a beautiful medal at a budget-friendly price. The Math medal features a calculator over a background of stars on the front and a 1 1/2" personalization area on the back. The ring at the top makes it simple to attach to a ribbon, chain, or even a keychain to complete your award. Available in 26 styles and an insert holder for a custom design you're sure to find just what you need for your awards. Superstar Medals are available in Bright Gold, Bright Silver, and Bright Bronze. Medals are a time-honored award for achievement in sports and academics and the 2" Superstar medal is a beautiful medal at a budget-friendly price. The Music medal features a treble clef and musical notes over a background of stars on the front and a 1 1/2" personalization area on the back. The ring at the top makes it simple to attach to a ribbon, chain, or even a keychain to complete your award. 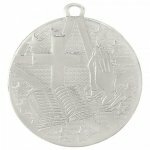 Available in 26 styles and an insert holder for a custom design you're sure to find just what you need for your awards. Superstar Medals are available in Bright Gold, Bright Silver, and Bright Bronze. 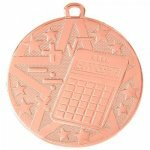 Medals are a time-honored award for achievement in sports and academics and the 2" Superstar medal is a beautiful medal at a budget-friendly price. 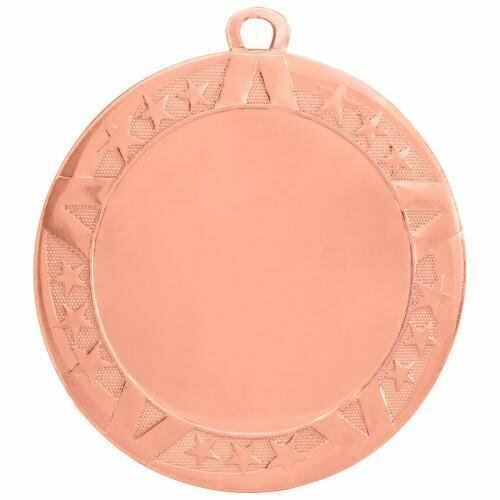 The Participant medal features a Torch with a Participant banner over a background of stars on the front and a 1 1/2" personalization area on the back. The ring at the top makes it simple to attach to a ribbon, chain, or even a keychain to complete your award. Available in 26 styles and an insert holder for a custom design you're sure to find just what you need for your awards. 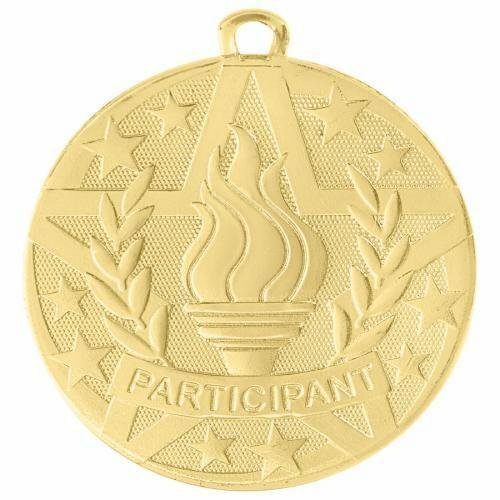 Superstar Medals are available in Bright Gold, Bright Silver, and Bright Bronze. 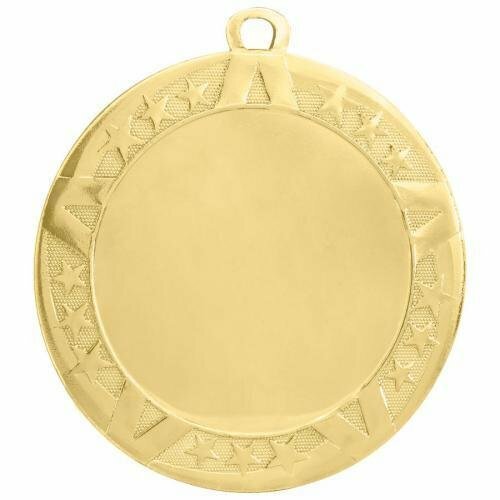 Medals are a time-honored award for achievement in sports and academics and the 2" Superstar medal is a beautiful medal at a budget-friendly price. 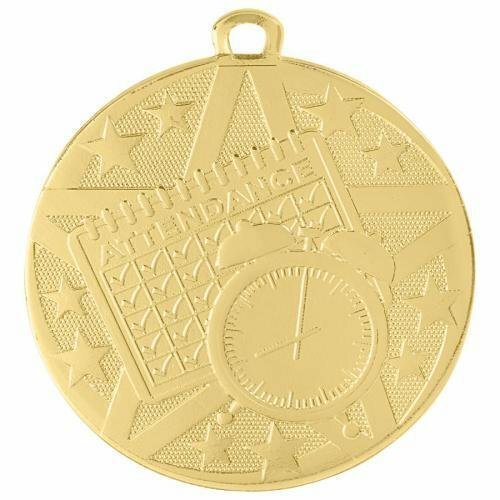 The Perfect Attendance Medal features a calendar and a clock over a background of stars on the front and a 1 1/2" personalization area on the back. The ring at the top makes it simple to attach to a ribbon, chain, or even a keychain to complete your award. Available in 26 styles and an insert holder for a custom design you're sure to find just what you need for your awards. Superstar Medals are available in Bright Gold, Bright Silver, and Bright Bronze. Production lead time for this clock is 5 days. This clock has a minimum order quantity of 12. 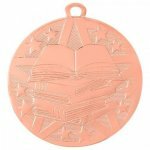 Medals are a time-honored award for achievement in sports and academics and the 2" Superstar medal is a beautiful medal at a budget-friendly price. The Pinewood Derby medal features a Pinewood Derby car and crossed flags over a background of stars on the front and a 1 1/2" personalization area on the back. The ring at the top makes it simple to attach to a ribbon, chain, or even a keychain to complete your award. Available in 26 styles and an insert holder for a custom design you're sure to find just what you need for your awards. 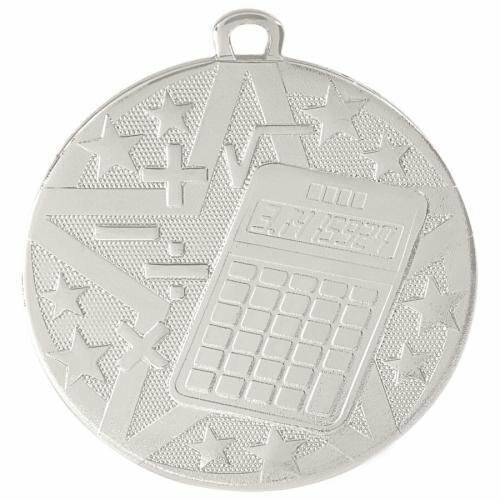 Superstar Medals are available in Bright Gold, Bright Silver, and Bright Bronze. Medals are a time-honored award for achievement in sports and academics and the 2" Superstar medal is a beautiful medal at a budget-friendly price. The Reading medal features a stack of books over a background of stars on the front and a 1 1/2" personalization area on the back. The ring at the top makes it simple to attach to a ribbon, chain, or even a keychain to complete your award. Available in 26 styles and an insert holder for a custom design you're sure to find just what you need for your awards. Superstar Medals are available in Bright Gold, Bright Silver, and Bright Bronze. Medals are a time-honored award for achievement in sports and academics and the 2" Superstar medal is a beautiful medal at a budget-friendly price. The Religion medal features a Bible, Cross, and Praying Hands over a background of stars on the front and a 1 1/2" personalization area on the back. The ring at the top makes it simple to attach to a ribbon, chain, or even a keychain to complete your award. Available in 26 styles and an insert holder for a custom design you're sure to find just what you need for your awards. 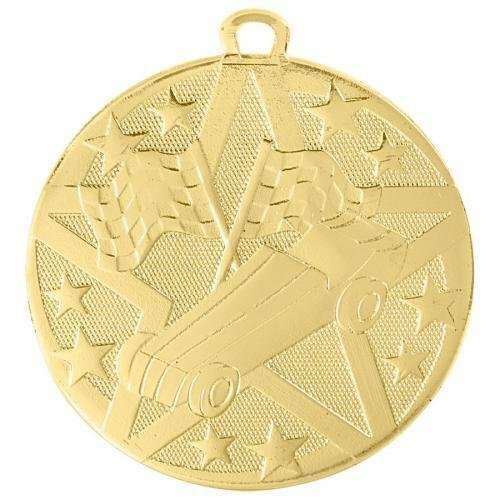 Superstar Medals are available in Bright Gold, Bright Silver, and Bright Bronze. 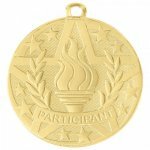 Medals are a time-honored award for achievement in sports and academics and the 2" Superstar medal is a beautiful medal at a budget-friendly price. The Science medal features a Microscope and Beaker over a background of stars on the front and a 1 1/2" personalization area on the back. The ring at the top makes it simple to attach to a ribbon, chain, or even a keychain to complete your award. Available in 26 styles and an insert holder for a custom design you're sure to find just what you need for your awards. Superstar Medals are available in Bright Gold, Bright Silver, and Bright Bronze.